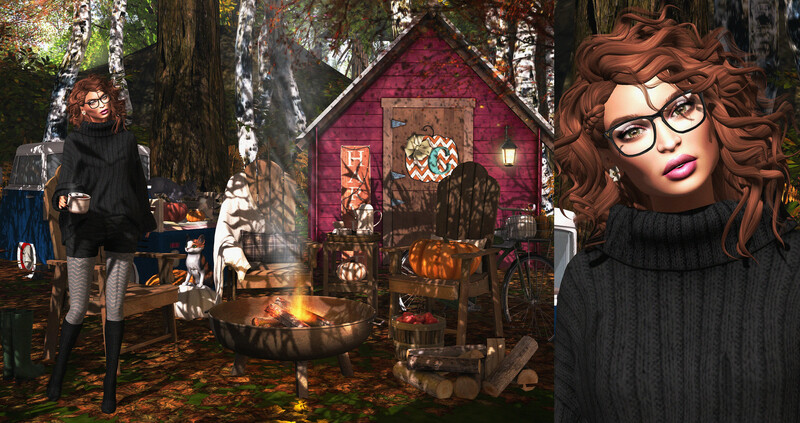 Today I have a Fall pic for you featuring the Bellevie Campfire Set from What Next that includes the chairs, table, fire and pile of wood. I also adore my look today that started with the new sweater and shorts from Coco and boots from Ison; Also have pretty new makeup from Veechi and The Skinnery. I love the latest round of Collabor88, it’s just fantastic, all the easy, sporty clothing and lots of things to help decorate our home with that are a bit out of the norm. These are two outfits that I came up with that have that sporty, workout, dance feel to them. I think I could probably come up with several more, so who knows, I may make another post along these lines. Hey all! Please forgive my lack of posts this week. I’ve been setting up new land with my friend Dawne and decorating my home for Christmas. On top of that my hubby has been home all week in RL on vacation so I’ve been opting to spend more time with him and kiddo this week. However, I’m back today with this fab outfit I absolutely adore. It includes newness from Truth, IT!, Ison, Blueberry and Breathe. I also got myself a new face, something we can only say in SL, and purchased a new Catwa head, so now I can show off so much awesome makeup that I come across for that head! Hey my readers! Yep, just as my title says my little old blog turned five on November 17th; It’s hard to believe I’ve been blogging that many years. I started this blog as a way to show my cute outfits I put together and to have a creative outlet when time allowed. Over these years I’ve struggled to find my place, my style and my voice in an ever changing and growing blogger population. I’ve learned to embrace who I am, constantly challenge myself and to grow in my skills and abilities. There have been times of frustration and rejection along with times of great excitement and acceptance. Over these years I’ve had, and still have, the opportunity to blog for some of the most amazing creators and events on the grid. For them, and for all those who follow and read my blog, or fave my photos on Flickr, I’m thankful. Now let’s see what my sixth year brings! So I decided to rope Etherian into helping me with today’s post since I do not show off couples/friends poses enough and it was also time for him and I to get a pic together. I headed over to the always beautiful Blithe sim to find a great picturesque locale and used new Dreamers pose from An Lar Poses. His new outfit and shoes are from the latest round of The Mens Dept, while my ensemble come from all over the grid. I have to make special mention about Veechi who I have come to adore since they do makeup for Genesis Lab. I know it’s hard to see but I’m wearing the blush pack I got at Summerfest (which is now closed) and shadows that are currently at C88. They also have made beauty marks and freckles that can be used for Genesis heads.